The Senior team’s 2017 preseason schedule has been announced, and includes rookie sessions, training camps and warm-up games against Premier Division opposition. Rookie sessions designed specifically for new players will take place at Bedford International Athletics Stadium (BIAS) on Sunday 8th and Sunday 15th January. These will be followed by a full practice session on Sunday 22nd January and the first of four “mini-camps” on Sunday 29th. Full training sessions will take place on Sunday 5th and 12th February before the second mini-camp on 19th and a scrimmage at Kent Exiles on Sunday 26th. Further training sessions and mini-camps will be held throughout March and April, and on 19th March Premier Division Bristol Aztecs come to Bedford for a scrimmage. All practice sessions and camps take place between 11am and 1.10pm. To register your interest in one of our rookie sessions click here to visit our Join Us page. Selection of photos from the pre-season scrimmage between the Eagles and Kent Exiles at Bedford International Athletics Stadium on Sunday 28th February 2016. Pictures by Gergo Toth Photo / 2G Creative. Prints available at www.gergotothphoto.co.uk. Offensive Coordinator Neale McMaster was very pleased with how the team has come together during this off-season’s training camps so far. The second non-residential camp of the winter took place in Bedford this past weekend, and was attended by over 50 players across the two days. Offensively, I thought we had a terrific second camp, not just in terms of installing plays, but coming together as a team and a family. We’ve spent a lot of time together as an offense over the past two camps – over 36 hours – and I really started to notice a difference on Sunday evening’s practice. We’ve developed the offense and guys have picked it up so quickly, we’ve made the leap now from correcting basic playbook knowledge to correcting technique and minor details, and that normally doesn’t happen until later in the season so it’s pleasing to see that happening so early. In particular I’ve been impressed with how well our senior players have taken to mentoring our younger rookies, and how much our rookies have progressed in a few camps. That kind of bond is what makes championship teams, and I’m hoping to see a big performance from our offense in what should be a good test against the Kent Exiles on Sunday. 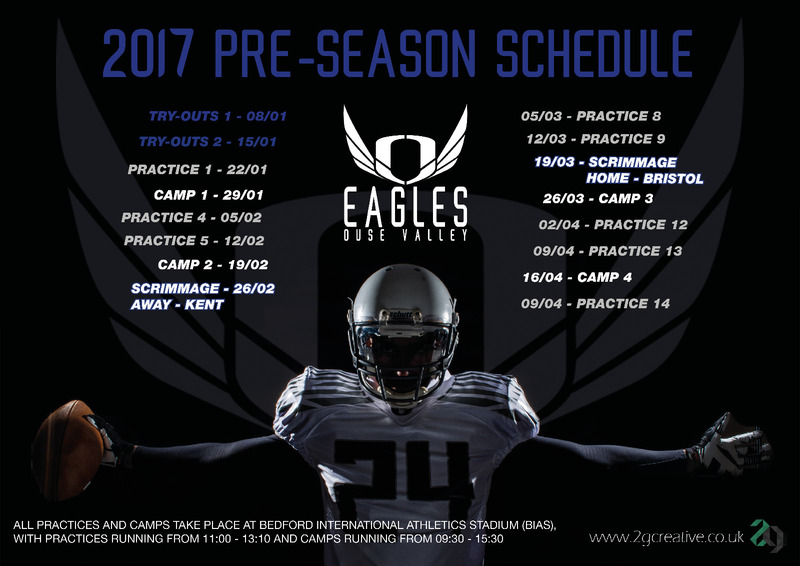 This weekend the team welcome Kent Exiles to Bedford International Athletics Stadium for a controlled scrimmage, which gives rookies and first-year players valuable game day experience, and an opportunity to embed what has been learnt during the pre-season so far. As a result of this weekend’s scrimmage there is no practice for the senior team on Sunday. Youth Team training will take place at BIAS on Sunday afternoon between 1 and 3pm. Defensive Coordinator Darren Hill described himself as being “delighted” with the progress made by the team during this off-season’s training camps. The second non-residential training camp of the winter took place in Bedford this past weekend, and was attended by over 50 players across the two days. The second camp was another great success. Both days saw a combination of scheme install, individual and group skills, film review, group and team practice. I am delighted with the progress the team is making as a whole and all the players have improved tremendously over the last two days.